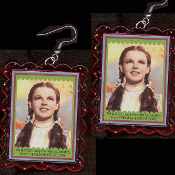 HUGE Wizard of Oz - DOROTHY EARRINGS - Funky Dorothy Gale Kansas Over-the-Rainbow Novelty Costume Jewelry - BIG clear hot pink glitter plastic frame toy Judy Garland photo charms, approx 1-7/8-inch (4.69cm) tall x 1.5-inch (3.75cm) wide. Follow the Yellow Brick Road. There's No Place Like Home!